« Focus on one person in the middle of the crowd throughout your speech. Afterward, trail him home. I have a few points to make in response. What follows is a critique of the table above, not of the Bible or Christianity. (All quotes from the NIV). Isaiah 40:22 is usually translated “circle of the Earth”, and is ambiguous between a disk and a sphere. In any case, the phrase plausibly refers to the shape of the horizon, not the entire Earth. John 38:19-20 says: “Where is the way to the dwelling of light, and where is the place of darkness, that you may take it to its territory and that you may discern the paths to its home?”. This couldn’t be more obviously poetical, and is not making any claim about the physical properties of light. Hebrews 11:3 is categorically not stating that the world is made of atoms. It states that “the universe was formed at God’s command, so that what is seen was not made out of what was visible.” It is stating that God’s creation of the universe is out of nothing, rather than out of pre-existing material that God simply rearranged. In any case, atoms are not literally invisible. Bernard Ramm’s “The Christian View of Science and Scripture” shot down this interpretation in 1954. There are no references in the middle column. Many of these claims are doubtful. Stars have different colours, obvious to the naked eye on a dark night. So it is very unlikely that they thought all stars were the same. Ancient Babylonian and Greek astronomy didn’t believe that the world rested on an animal. The ancient Greeks, and particularly Aristotelian physics, knew that the air had weight (i.e. they knew that air would sink towards the centre of the Earth). Sick people were bled under the Hippocratic medical theory of ancient Greece. The theory does not deny the importance of blood to life. Blood was “let” in order to restore balance to the “humors” , not because blood was useless. They knew that things bled to death. In any case, the theory is unlikely to have been known to the writer of Leviticus, and it isn’t too much of a stretch to imagine that the ancient Hebrews knew that bleeding things died. The table assumes a great deal of uniformity in the natural philosophy of the ancients. Everyone thought that there were only 1100 stars? Everyone thought that the ocean floor was flat? Science now does not know whether there are innumerable stars, if that is taken to mean an infinite number of stars. It is obviously something of an overstatement to say that blood is the “source of life and health”. Certainly, I’d rather keep mine but blood is a product of life rather than a source. This entire line of argument is deeply flawed. In these passages, the Bible is not attempting to teach facts about nature. The writer is using facts about nature to illustrate other, non-scientific points. When Paul says “The sun has one kind of splendor, the moon another and the stars another; and star differs from star in splendor”, he is using this as an example of the different kinds of physical things that exist: “Not all flesh is the same” (verse 42). There is no point using an illustration if the reader is not familiar with it. The fact that these writers can appeal to a certain fact to illustrate a point shows that it was something that his audience believed. If they said: “everything just goes round in circles, like the electron in orbit around an atomic nucleus”, the readers wouldn’t have understood. Even if God had whispered a scientific fact in their ear, they would have had no use for it. This applies just as obviously in reverse, to those passages which contradict modern science. For example, in Job 37 Elihu says: “Listen to this, Job; stop and consider God’s wonders. Do you know how God controls the clouds and makes his lightning flash? … can you join him in spreading out the skies, hard as a mirror of cast bronze?”. The point of this poetical passage is not to teach something about the skies (which aren’t hard, you may know), but rather God’s authority over nature1. There is (arguably) no tension between acknowledging the scientific inaccuracy of this passage and the view that the Bible is inerrant in all that it teaches. No statement of the doctrine of Biblical inerrancy implies that the writers of the Bible were correct in all that they believed. I think that in discussions of physical problems we ought to begin not from the authority of scriptural passages but from sense­ experiences and necessary demonstrations; for the holy Bible and the phenomena of nature proceed alike from the divine Word the former as the dictate of the Holy Ghost and the latter as the observant executrix of God’s commands. It is necessary for the Bible, in order to be accommodated to the understanding of every man, to speak many things which appear to differ from the absolute truth so far as the bare meaning of the words is concerned. But Nature, on the other hand, is inexorable and immutable; she never transgresses the laws imposed upon her, or cares a whit whether her abstruse reasons and methods of operation are understandable to men. 1. A few caveats. The passage claims only to be a record of a conversation between Elihu and Job, and when God appears in the next chapter he doesn’t exactly endorse all the ideas expressed so far. Also and as always, translation from any ancient language is a subtle art. The word translated “mirror” only appears once in the bible and may indicate an appearance, “skies” can be translated “clouds”, “cast bronze” could mean “molten”, so that the verse might say “Can you, with Him, spread out the mighty clouds, with a molten appearance?”. This fits the emphasis of the chapter on weather (thunder, rain, winds, clouds) rather than God’s original creation. I’m in no place to give an expert opinion on ancient Hebrew – I just did a bit of Googling. Work it out for yourself. Wow. What a crock. Do you know of anyone who is actually spreading this nonsense?? Yes, it always annoys me when people try to read the Bible as a scientific text, rather than trying to understand it according to the genres intended by the writers, such as poetry, history, advice, moral instruction, etc. “The ancient Greeks, and particularly Aristotelian physics, knew that the air had weight (i.e. they knew that air would sink towards the centre of the Earth).” This needs a bit more clarification. Aristotle’s theory of the four elements – earth, water, wind and fire – postulated that the natural place of each of the elements was in the order I’ve just listed them. Earth tends towards the centre of the universe, because the crap settles to the bottom. Water tends towards the centre of the universe as well, but not as strongly as Earth. Air, in turn, tends to sit above water and fire above air. This obviously doesn’t refer to weight in the Newtonian sense, of a force towards the centre of the Earth, but rather in the “amount of stuff’ sense, as is clear from the parallel with measuring the waters (of the ocean). The analogy is of God weighing the winds in a balance and determining how much air there would be. As such, the ancients knew that the air consisted of stuff. Luke, will you make a blog post about the new Planck data? 🙂 Would love to hear your opinions on it. And secondly, cosmic inflation, adding the condition that the universe started to exist directly in the inflationary epoch, emtpy and with only the inflaton field, which from the GR viewpoint is just a big cosmological constant. This condition is wholly plausible since there is not, and most probably there will never be, any observable pre-inflationary imprint in the CMB or wherever. Agree with you here, Luke. I have Muslim friends who often try the same trick on me with the Quran, such as how it predicts embryology. As a Christian myself, I cringe when I see people try to use this sort of reasoning. It smacks of very poor scholarship. Thanks for your great blog. I must agree that the Bible should not be used as a science textbook. You are, however, taking the chart out of context. This chart’s purpose is showing that the Bible aligns with what we know to be true in science today. 2 Timothy 3:16 says ” all scripture is God breathed. There was a time when civilizations believed the Earth to be flat. It wasn’t until the 16th century when Pythagoras, a Greek wise man discovered the Earth was round. When all along, it was in the Bible. If you truly look at the Hebrew original translation of Isaiah 40:22 and used the verse in context, you would find that it is not, in fact, talking about the horizon, but the Earth as a whole. To say that the Bible does not align with modern science is to say that either the Bible, or modern science is flawed. Well, modern science says that natural selection proves evolution. If you were to look closely, you would find it proves nothing but genetics. While the Bible does NOT align with evolution (Genesis 1) it has no problems with genetics. Therefore, I chose to believe modern science, which claims evolution to be true, to be flawed. The Bible, then, must be true. My question to you, Luke, is how much research did you put into this? And how much of it was cold hard facts and evidence? How much of it was another’s words with no real evidence behind it? How much of it was assumptions? Pythagoras lived about 500BC. The roundness of the Earth was not discovered by modern science, and certainly did not require modern technology. Aristotle (350 BC), for example, argued from the fact that the shadow of the Earth on the moon during an eclipse is circular, and from the changing night sky as one travels north or south. The Greeks were not the first to travel the Earth, nor the first astronomers, so it is unlikely that Pythagoras was actually the first – but it’s so long ago, we don’t know. 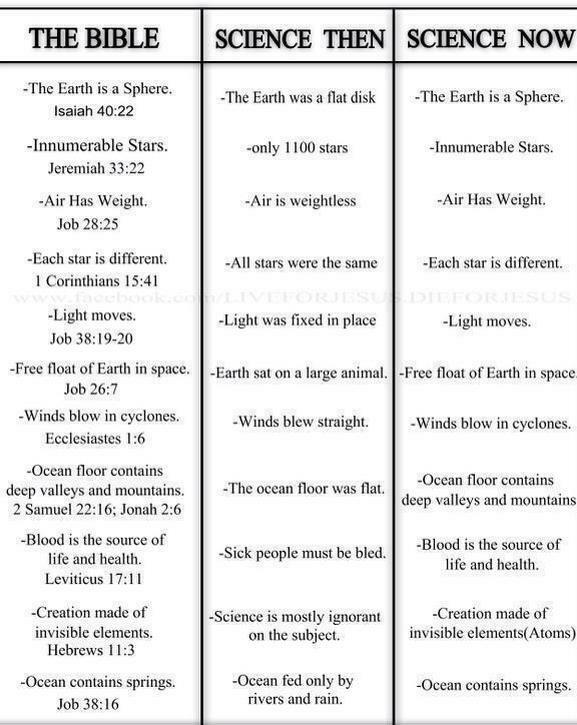 Either way, its hard to say that no one knew the true shape of the Earth before Isaiah in the 700’s BC. Proverbs 8:27: When he established the heavens, I was there; when he drew a circle on the face of the deep. These all support the horizon reading. There is nothing in the context to suggest otherwise. Way to paraphrase. Strange though all that science then was informed by the church and many scientists influenced and in some cases killed by the church as well. You are forgetting the rest of Isaiah 40:22. Look up many videos on how the built a movie studio at Disney (Illuminate Bloodline). Pictures NASA show of Earth are paintings that have changed… Why would God want a big Ball for his footstool? How could God looked down yo see everyone on a big Ball? If you know the Deception and our Fake Jesuit History books you’ll know that we have been lied to our whole lives. The Satanists go Against Everything God tells us. Weren’t we told in history class we come from Apes? That the Dinosaurs where here millions yes ago when Book of Job God tells him he created Leviathan & Behemoth we he created us. Did God say astroids wiped out the Earth or Ice Age? No, he flooded twice. Twice being that he flooded a 1/3 of it before Noah or it could be after I think n that’s where the city of Atlantis is.. look up all the ancient Cities being found in the Ocean n what’s in Antarctica? Pray on it and ask God for guidance to seek the truth n do your own research.